The are two names that excite me the most when it comes to theater. First is Stephen Sondheim - his plays define a lot of my love for musicals. The first play that I truly fell in love with was Into the Woods, which coincidentally is getting a movie adaptation. The other big name is Bob Fosse, who one of the most brilliant choreographers that Broadway has ever seen. He has such a distinct style and he influenced quite a number of different musicals over the years. Chicago is one of those musicals that will always be distinctly in that Fosse spirit. The greater focus on the dancing and the minimalist approach to everything else just make this particular play a unique experience. 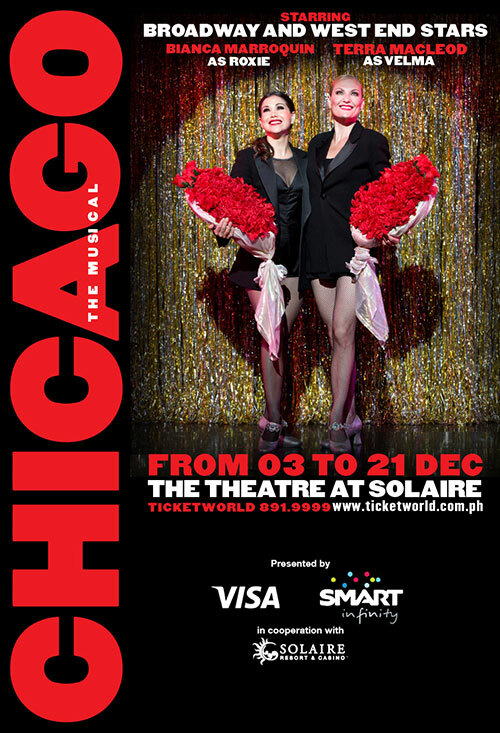 So Tobie and I were pretty excited when it was announced that an international touring company was bringing Chicago here to Manila. It was set to be staged at a brand new theater, which was another exciting prospect for theater fans in Metro Manila. And it goes without saying that we enjoyed ourselves quite significantly last Sunday. Synopsis: Chicago: The Musical is America's longest running musical and the 2nd-longest on Broadway. It originally debuted in 1975 with music by John Kander and book and lyrics by Fred Ebb and to some extent Bob Fosse. It was based on the 1926 stage play of the same name by Maurine Dallas Watkins. The Manila production was brought to the country by Lunchbox Theatrical Productions with direction by Walter Bobbie. This production was staged at The Theatre at Solaire starting December 3 and is set to run until December 21, 2014. It's the 1920s and we first see the chorus girl Roxie Hart (Bianca Marroquin) shooting her lover, Fred Casely (Bradley Gibson). She somehow manages to convince her husband Amos (Jacob Keith Watson) that it was a case of self-defense against a burglar, but once Fred's identity is revealed, his false report all falls apart and Roxie is arrested. Thus she's sent off to the Cook County Jail where the women's block is run by the corrupt Matron "Mama" Morton (Roz Ryan). Case in point, we see how she has helped another inmate, Velma Kelly (Terra C. MacLeod) to get more media exposure and the services of Billy Flynn (Jeff McCarthy), Chicago's top defense lawyer. So Roxie strikes a deal with Mama to get similar benefits including the services of Billy Flynn. But he costs $5,000 to hire and she cons Amos into figuring out how to raise the funds. Thus we see Roxie starting to get more and more media mileage as she follows Billy's particular instructions about how to present herself while other inmates like Velma are annoyed at how much attention she's getting and how this in turn delays their own court cases. But of course maintaining this attention is not an easy task - everyone is practically just waiting for the next big case to hit the headlines. We can't talk about a Bob Fosse inspired production without talking about the dancing. And in this regard, the company of Chicago did a tremendous job of bringing this play to life. The choreography remained distinctly Fosse complete with focus on isolation movements, brilliantly coordinated group numbers and elegant tableaus that have the players in some pretty interesting shapes and forms. I'm not ashamed to admit that I got a little teary-eyed when the show began since it was all so brilliant. The stage arrangement was pretty interesting two, with the initially unusual decision to have the orchestra taking up center stage. It first felt like a rather awkward way to implement things given how much space it took up, but over time it made sense. The orchestra stand was also a way to mask various entrances and exits for the players and there were quite a number of humorous "4th wall breaking" moments where the players address the conductor and other members of the orchestra crew. Then we have the fact that the dancers and other performers don't always fully exit the stage - a lot of times they just take seats at the sides of the stage and wait for the next number. And that can only provide so much rest since they have to stay in character all throughout. The main players were pretty good, although at times it was a little tricky to determine if some of my concerns about singing were a performance concern or maybe the audio quality of the theater. Roxie established a great connection with the audience and Velma was pretty impressive during her individual dance numbers. Billy Flynn really had the swagger needed and Mama had some impressive vocal chops even though she didn't really perform all that much. And I'm pretty sure everyone felt strongly for Amos, who oddly sounded like Seth Rogen at times. This is a pretty dark production, which ties into the usual Fosse style combined with the satirical tone of this musical. It also sort of has that weird tendency of dealing with difficult subject matter with a dance number as opposed an actual scene to act out. At times it can feel a little weird, especially when you're not used to it. But stylistically, it works out pretty well. And as much as I kind of wish for more lights here and there or somehow more pop, that also wouldn't have worked with the tone of the play as a whole. Our main challenge was the venue itself - pretty much all the balcony seats at The Theatre at Solaire are horribly lacking in legroom, making for an uncomfortable viewing experience. It's such a shame since at first glance the venue looks pretty impressive and they at least made sure that all the seats have pretty good sight lines with respect to the stage. But if even a shorter guy like me finds the lack of legroom noticeable, it's even worse for taller folks like Tobie and such. Back on point, Chicago is a brilliant production and despite our physical discomfort remains to be one of the best musicals to come to Manila this year. It's totally worth catching, but do try to get seats in the orchestra. Thus production still rates a great 5 classic Fosse moments out of a possible 5.